AMTECH™ Lift up Non Return Valve in common with all Non Return Valve, are used to prevent back flow in the line, and operate automatically, according to increases or decreases in line pressures. 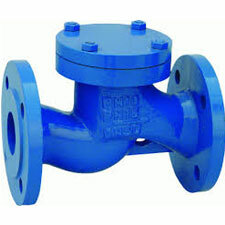 Flow through a Lift up Non Return Valve is the same as a globe valve. The disc raises up off of the seat as pressure below the disc increases, while a drop in pressure on the inlet side and a build up of pressure on the outlet side causes the valve to close. Back pressure in the line holds the disc in the closed position.